Favorite Albums of the Decade…So Far! Believe it or not we’re halfway through the decade that is the twenty-teens. The first half of the decade that began in 2010 has been a delicious musical treasure trove and as I looked back on my top 10 lists for each year it was an eclectic and wonderful collection. It is clear though from my favorites that I am mellowing as I age, though there is still at least one hard rockin’ group on this list. Still, I’m definitely more of an alternative, neo-disco and Americana guy. 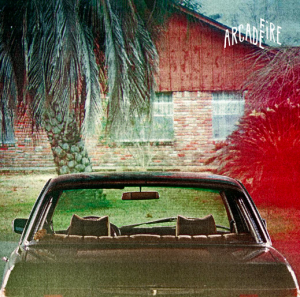 The Suburbs (2010) — Arcade Fire. I admit I came a little late to the Arcade Fire juggernaut but when I finally “discovered” them I went all in. The album, written about the Butler brothers’ early life growing up in the Houston burbs, received universal acclaim and was the surprise winner of “Album of the Year” at the Grammy’s and also won the top prize at the Brits and the Juno awards. It’s five years old now and I still listen to it all the time and seeing them live last summer was one of the highlights of my concert-going life. The King is Dead (2011) — The Decemberists. I was already a fan when this album came out but it has since become my favorite by the band. That said, their new release What a Terrible World, What a Beautiful World (2015) is wonderful and I wouldn’t be surprised if it landed at or near the top of both my best of 2015 list and my end of the decade survey. Colin Meloy could sing the alphabet and I’d be enthralled. Babel (2012) — Mumford & Sons. The Mumfords burst onto the musical landscape in 2009 with Sigh No More, an album that kicked off a re-birth of Appalachian sounds that hasn’t slowed. Babel was their brilliant follow up and my favorite album of 2012. El Camino (2011) — The Black Keys. In contrast to folk-infused bands like The Decemberists and Mumford & Sons, the Black Keys bring a hard rockin’ R&B sound that never quits. Echoing bands like The Ramones, The Clash and even Led Zeppelin, Dan and Patrick Carney seem to have endless energy. I knew I was going to love this record the first time I heard Lonely Boy and saw that silly video. Bankrupt! (2013) — Phoenix. These Frenchmen remind me so much of the bands I grew up with in the 80s and I was a huge fan of 2009’s Wolfgang Amadeus Phoenix. Bankrupt! is just as good, if not a touch better. My only disappointment is that they canceled their concert in 2013 so I’ve never seen them live. Someday. Codes & Keys (2011) — Death Cab For Cutie. Not everyone liked Codes & Keys when it came out following the huge success of 2008’s Narrow Stairs, but I actually like Codes & Keys even more. In fact, You Are a Tourist from Codes & Keys is still the band’s only No. 1 hit ever, reaching the top spot on the Billboard Adult Alternative chart. Turn Blue (2014) — The Black Keys. It’s hard to keep churning out great album after great album but the Keys have been doing it for almost two decades and Turn Blue is gorgeous. Perhaps Fever and Gotta Get Away are overplayed, but that’s because they are great. That said, my favorite track is the first one, Weight of Love, which is 6:50 worth of musical genius. Oh, and how can you not love an album announced on Mike Tyson’s Twitter account. Broken Bells (2010) — Broken Bells. Top to bottom a gorgeous musical collaboration by super producer Danger Mouse and James Mercer from The Shins. I couldn’t get enough of this record and waited anxiously for the duo’s second collaboration to arrive last year. After the Disco (2014) gets an honorable mention for this list as well. Got to see them perform live last year and it was a highlight of a great year of concert going. Almost made the list: Right Thoughts, Right Words, Right Action (2013) by Franz Ferdinand; Blak and Blu (2012) by Gary Clark, Jr.; Grace Potter and the Nocturnals (2010) by Grace Potter and the Nocturnals.